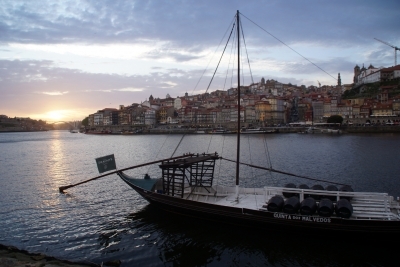 The Historic Centre of Oporto is a commercial port that saw its heyday in the 14th and 15th century. The city is situated on a steep hill along the estuary of the river Douro, which extends to the coastline of the Atlantic Ocean. Oporto is linked to the development of Portuguese shipbuiding, the conquests of Prince Henry the Navigator and the production of port wine. The nominated area is enclosed within the 14th century Fernandine city walls. It is chock-full with churches, monasteries, public buildings, a bishops palace and the cathedral. All buildings were erected between the 13th and 19th century, based on a medieval town plan and using totally different building styles. During the past Easter Weekend I used Oporto as a base to visit the Santiago de Compostela and Côa Valley WHS. With the introduction of low-cost flights, aiming at secondary airports, Oporto suddenly has become a ‘hot’ destination for a weekend-trip. My Transavia flight from Amsterdam was fully booked. I had been to Oporto before in 1991, as part of a one-month long Interrail-trip across the Iberian peninsula. I enjoyed it at the time because of its unique, somewhat raw atmosphere. Unfortunately this time around the weather forecast for the day was terrible. I was tempted to stay in my hotel room all day. But the check-out time at 11 a.m. was non-negotiable, so I returned my rental car to the airport, put my larger backpack in a locker and took the subway to the center of Oporto. I exited at a stop called ‘Bolhão’, and the first thing I saw above ground was this fantastic Santa Catarina church (see 2nd picture), totally covered with azulejos. I suddenly felt glad to be travelling and exploring again, despite the rain. I had chosen this metro stop because it lies next to the Bolhão covered market. Unfortunately I found the market closed for the day: Easter Monday is a public holiday in Portugal. So I walked a bit further down into the city center, to the other ‘attractions’ I had put on my to do-list beforehand. All the time it kept on raining and raining. When I reached the Cathedral, another of the city's landmarks, I found it closed too! I took shelter under some arcades and managed to take one gloomy picture of the Cathedral square. At the square I noticed a tour group with a guide, braving the weather conditions as well. I decided to follow them at an appropriate distance, hoping that they would lead me to the river side through the maze of narrow streets below the cathedral. Oporto is built on several hills, so everything is a bit of a hike here. The group stopped somewhere on 2/3 of the walk to hear a longer story from the guide. From that point on I managed to get to the Douro River under my own steam. This spot down from the Cathedral provides the iconic view of Oporto, with the river and the Dom Luis I bridge, the traditional wooden ships and port houses (wine cellars) on the other side. After having had a short look around at the waterfront, I headed back towards the center of the city to try to find a metro stop for the journey back to the airport. However I suddenly found myself in front of the Palacio da Bolsa (Stock Exchange Palace), where I noticed the front door to be open. This Palace is one of the main attractions of Porto. I thought it would be closed this afternoon, but I was clearly mistaken. Inside dozens of drenched tourists were waiting for a tour to start of this late-19th century showpiece. Of course I joined them. The tour is well worth it, especially the last room: the Arab room, the parlor where the traders from Porto received their important guests. The stock exchange is now no longer in use, but you can hire the halls for private functions. After the interesting tour I regained my courage to defy the (now only slight) rain. I went over to the adjacent Sao Francisco Church. Its catacombs, with rows of black-and-white tombs, are worth seeing. But the church above it is an unmissable great spectacle of baroque carvings and gold leaf! That made a great ending to my day in Oporto: it takes a grand city to still be worth visiting during a day of pouring rain. Oporto has passed this test. The historic centre of Oporto is located along the hillside of the northern bank of the Douro River, just a few kilometres from the Atlantic coast. In guidebooks, the historic centre is often subdivided into an upper town with the cathedral at the highest point and a lower town, the Ribeira quarter. But that’s only half the truth. Actually, Oporto is an up-and-down-up-and-down city, a proper visit of the core zone can be an exhausting exercise. In May 2018, I spent two and a half days and three nights in Oporto. 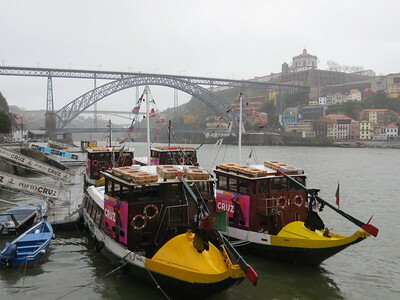 I had accommodation in Vila Nova de Gaia, just two hundred metres from the Ponte Dom Luis I. So I had several times the opportunity to enjoy the beautiful view of the old town from the top level of the bridge or from the opposite bank of the Douro. It is one of the most picturesque urban landscapes I’ve visited so far, almost a bit corny (take my photo as a proof): the river, wooden ships with old wine barrels, lines of colourful houses one above the other along the hillside. But that’s just the first, superficial impression, on closer inspection you get a different view. Some reviewers described Oporto as raw and dilapidated, I agree, and I also agree that this contributes to the special atmosphere. When I visited Oporto in May 2018, there were numerous construction cranes and scaffolding, many façades looked newly renovated, especially in the main streets such as the Rua das Flores. Obviously things have improved in recent years and Portugal is slowly recovering from the impact of the banking crisis ten years ago. But there is still a lot to do, when you take a look in side streets a bit off the beaten track, you will see many uninhabited and dilapidated houses, historic façades that no one has cared for since decades. Oporto does not impress primarily with outstanding individual buildings or by its architectural layout, the pleasure is more to stroll through the narrow streets, to discover some remote corners and to enjoy the atmosphere. But of course, there are significant buildings. Oporto is full of churches, most of which are Baroque, lavishly adorned in gold and with the omnipresent blue azulejos, testimonies of the glory of bygone times when Portugal gained its wealth from the colonies. Ribeira neighborhood with its narrow houses, the facades with colorful tiles or in pastel colors, some newly renovated. The area is very popular with tourists, there are many restaurants and bars on the riverside, but you see also washing on the line on the upper floors, indicating that most of the houses are inhabited. Oporto is a good spot to visit potential sites of the TWHS Álvaro Siza's Architecture Works. Many of his buildings are located in the outskirts of Oporto and in neighboring cities. But it is not yet specified in the T-list entry which buildings would be part of a nomination. Port wine tasting at Vila Nova da Gaia, I had a guided tour with tasting at Graham's, but there are plenty of other cellars, a nice addition to the visit of the Alto Douro WHS. Pont de D. Maria Pia, a railway bridge by Gustave Eiffel, about one kilometre east of the Ponte D. Luis I, but not in the core zone of the WHS. There are plans for a serial nomination of iron arched bridges in Portugal, France, Italy, and Germany. A Pérola do Bolhão, a grocery store. For whatever reason, the Portuguese love canned fish in countless variations, and they love to pack the cans in colourful paper. You’ll find that everywhere in Portugal, but this is one of the most lovely stores. Casa das Rolhas, a cork shop, not the usual souvenir stuff, but items for daily use and the household, bottle corks in all sizes etc. Finally, a warning: a local culinary specialty is Francesinha. It is a sandwich consisting of bread, ham, fat sausage and the like, covered with melted cheese and served in a thick, fat sauce. If that is not enough, you can get it with french fries and a fried egg. One of these covers the fat requirement of a small family for a week. If you are courageous you can try it, I did it, but gave up halfway. In my opinion, Oporto is one of the best WHS in Portugal, it has enough to offer to entertain a visitor for a few days and is one of the best destinations in Europe for a weekend trip. In June 2008, I made my second visit to Oporto. J.K. Rowling taught English in Oporto for two years in the early 1990s, when she wrote the first few chapters of Harry Potter and the Philosopher's Stone, the first novel in the series. 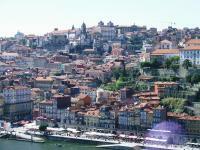 Oporto has since parlayed her stay into a cornerstone of its tourism industry. Livraria Lello & Irmão, the city’s stunning bookstore, claims to have inspired Hogwarts Grand Staircase. 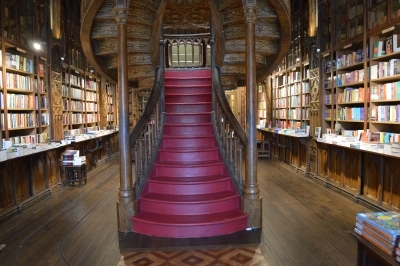 Due to its tenuous connection to the series, the bookstore has become one of the city’s most visited attractions, in such demand that visitors are required to purchase a €5 credit, which can be applied against a purchase. From what I saw, the bookstore derives most of its revenue from the breakage of unused credits. The bookstore is located in the buffer zone of the Historic Centre of Oporto, Luiz I Bridge and Monastery of Serra do Pilar WHS. I visited this WHS in August 2014. I spent 3 days here and I would have loved to stay longer. The historic centre is packed with sites to visit through narrow streets and alleys leading to several squares and eventually down to the waterfront by the Douro river. The rest of the city is falling down to pieces and decadent at best although I agree that this helps to have an authentic overall experience. The best viewpoints are to be found at Vila Nove de Gaia by the waterfront, in front of the monastery or on the funicular. The Igreja de São Francisco should not be missed as it has a unique interior and a beautiful courtyard full of azulejos. Other churches worth visiting for their azulejos exterior are the Church of St Nicholas which is just opposite the one of St Francis and the Church of the Holy Trinity. Oporto is a vibrant city and also the best place to go for a long day trip or 2 day trip to take in another WHS, the Alto Douro. 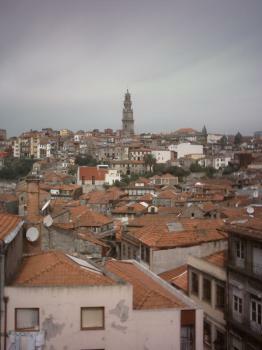 Torre dos Clérigos isn't the tallest building in Portugal, it's the tallest in Oporto. For instance, Lisbon has some buildings over 100 meters high. About Oporto, it's well worth a visit for at least a weekend. Apart from the magnificent historic center where my personal highlight is the Igreja de São Francisco (Church of São Francisco), whose interior is richly decorated with lots of golden objects and altars, you shouldn't miss out the cityscape from the south bank of the Douro river, the Foz district (where the river meets the sea) and the modern building of Casa da Música (Music Hall). Don't forget to eat a "francesinha", a typical sandwich made out of many different meats, cheese, a spicy sauce with Port wine, beer and many other "secret" ingredients. Delicious! Although there are a lot of steep hills to negotiate while visiting the sites here, there are a number of usful tram and bus routes that connect the different levels of the city. I too found the azuelejos impressive, especially those in the foyer of Sao Bento station and on the facade Congregados church. The Carmo church, city hall, Misericordia church and the Palacio da Bolsa were interesting architecturally, although after a while I found the predominant grey stone a bit depressing. It was a dull and grey day that I was in Porto, and it fit the atmosphere of the city so well. This is not the most aesthetically appealing of cities but it is one that I really enjoyed as it had such a fantastic atmosphere. It is a bit dilapidated but again this just adds to the character. The highlights are the bridges across the Douro going to the wine heaven that is Vila Nova de Gaia. The centre is dotted with sights worth seeing especially the Torre dos Clerigos which affords great views of the whole centre and is also the highest tower in Portugal. There are also great examples of azulejos scattered through out the city especially in the main train station and the Igreja do Carmo. The Riberia district is the heart of the UNESCO site and it clings to the steep banks of the Douro and it is jus a delight to wander around and get lost in. I loved my time in Portugal and this was one of the highlights defiantly well worth a few days of any ones time. Oporto has its own international airport and can be reached by (mainly) low-cost flights from all over Europe. A metro system provides easy access into the city center from there. Prince Henry the Navigator: Traditionally born (1394) in the Casa do Infante (orignally built as a Customs House and Mint). Built in the 14th century: The rich and varied civil architecture of the historic centre express the cultural values of succeeding periods- Romanesque, Gothic, Renaissance, Baroque, Neo-Ciassical, and modern. The part of the modern town proposed for inscription on the World Heritage List is that enclosed within the enceinte of the 14th century Fernandine walls, together with some smaller areas that retain their medieval characteristics.